I should at least make a topic for updates on this. Essentially, this is aimed at KermM or anyone else working on SC3. Essentially, I am making a extendable and modular sprite and animation editor. It uses jQuery and jQuery UI right now (UI needed as I am basically having it generate Cemetech-styled UI elements). 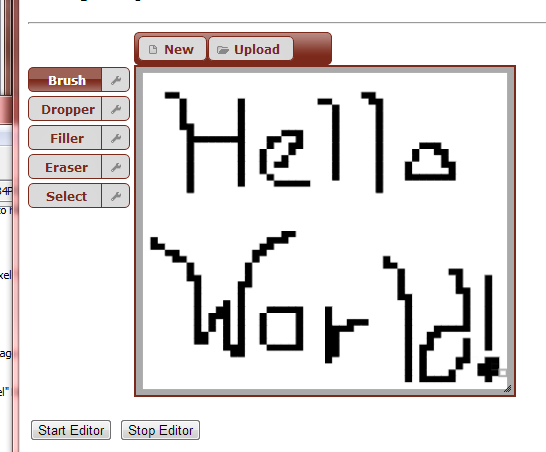 The goal for now is getting core components ready, such as the toolbar, different tools, viewer/editor, timeline, etc.. This editor is extendable, so getting image loading of different formats will only require writing different extensions and the core editor will handle the rest (aimed at loading image files, parsing programs from file and from the site, raw image data, etc.). In order to make it easy to use, I am having it dump all of its needed elements into an element provided the ID for it. It will handle all script loading, UI creation and handling, just needs a few lines to start and extensions to be functional. Currently can support multiple images and has a mouse over callback system in-place with a test that highlights the current pixel. In the works is a robust way of spacing/sizing each pixel. Next will be the toolbars (different ones for the different image types). Right now, alpha is ignored as I plan on doing masked transparency or RGBA5551 (or some other system). The event system will be expanded to handle clicks, drags, etc. for tools like line drawing, droppers, brushes, etc..
Last on the list will be an animation support. Not that I will have to modify what I have, I will just lack a GUI for it. Essentially, this is aimed at KermM or anyone else working on SC3. I invited someone competent to join me on SC3, but I was sadly turned down. This looks like a great start so far, and I will definitely be watching its progress with rapt attention. Do you have any ideas on storing animated sprites with SC3? Also, what image formats will you be able to save? I was looking at supporting all of the major calcs given I have the proper info on them. Working on the toolbar now after I made the canvas user-resizable with dragging. I will modify the inside padding later. Working on adding in the actual toolbars and menus for them. Once I get the init process down, I will start to add functionality. Keep up the good work, AHelper. 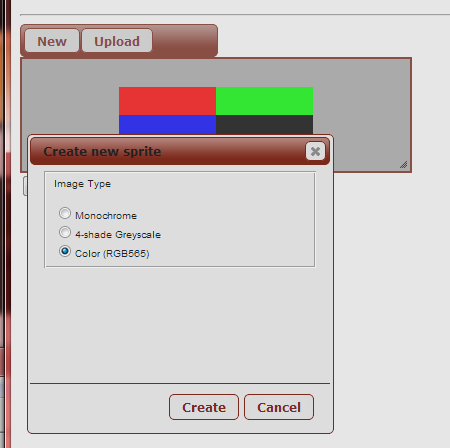 By the way, will it have the ability to select between 2/3/4-color grayscale, 1/2/4/8-bit paletted color, and full color? Or something? That might be too much work for something like this. I have no ideas on animated sprites. Keep up the good work, AHelper. 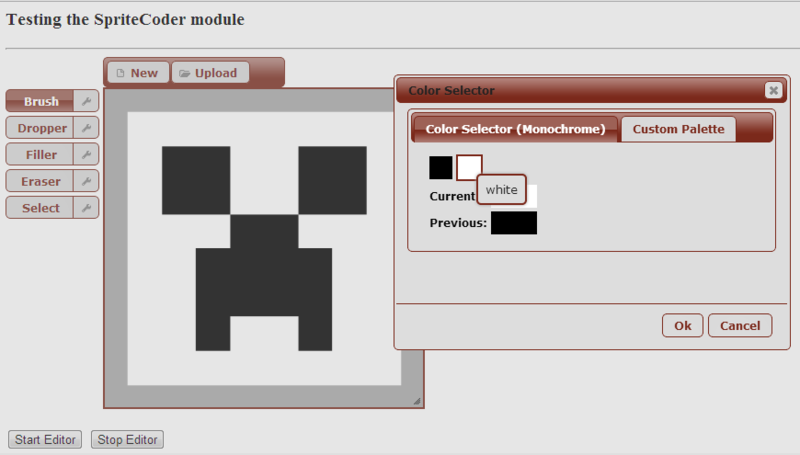 By the way, will it have the ability to select between 2/3/4-color grayscale, 1/2/4/8-bit paletted color, and full color? Or something? That might be too much work for something like this. I have no ideas on animated sprites. Also, note the menu system working and the theme I made (can be adjusted, did what I could with multiple styles applied to a wide variety of elements and lack of customization). The canvas can be resized and I will allow it to snap back to a 1:1 aspect ratio with a button. Now, for uploads, will SC3 handle reading all of the image types, or will that be split off? Right now, different file types that can be imported/exported go through an extension that can be customized, such as having the image uploaded go through SC3 first. Also, what sort of meta-data can be saved in SC3 for identifying the image type? I am looking at simple things like the image type and transparency color (or pallet settings). Making images and input validation! I can test out Grammer things. 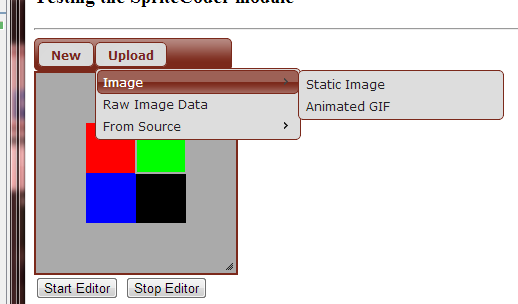 Also, for anybody trying to write an image editor or sprite editor, Grammer can use hexadecimal or direct data. It can also use sprite sizes that have a width a multiple of 8 and any pixel height. Large update: Tool system added, undo feature planning, toolbox lacks only additional tools, if any, and the color selector, and a robust system for input. In case anyone wants the jQuery UI theme URL, here it is: http://tinyurl.com/cemetechjqueryuitheme. Can I ask where the picture editor is? 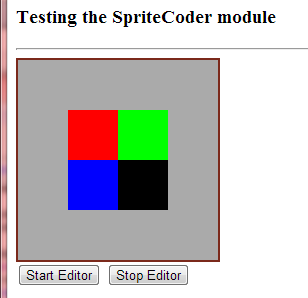 As you can see from this topic, it's going to be part of SourceCoder 3, but it's still in development. For now, you'll need to edit your picture in Paint, GIMP, or the image editor of your choice, then run it through SourceCoder. Working on this again, so except updates. I will get screenies once it becomes more functional. I will except updates. I'll also expect them, if that's okay with you. Once Sandpaper is completed, I'll try to bring SourceCoder 3 towards the front of my project queue again to sync with you. Excellent, I hope that the project can get merged into SC3 and be successfully integrated. I will still need to poke you for some way to make modules to link SpC to SC3 (loading/saving to projects). Padding around the image is back to being a static size yet again. Removed anti-aliasing, but still some artifacts remain from rounding issues. Brush tool now accepts color changes and draws in selected colors. Custom palette planned, no code for it. Bug fixed the canvas to not start selecting text. Aspect ratio forced when resizing. Add in the two other color modes. Think about having external color profiles to be used instead of hard-coding. Add in a mechanism to adjust image data to adapt to the selected color mode (changing 4-shade greyscale to monochrome, 16-bit RGB to 8- or 3-bit color (prism/TI84psec)). Palette system (Must talk to KermM if storage can be arranged for SC3 projects to save user-made palettes either per-image or just one palette file for everything, or just have SpC use local storage and store it for any project. Make the higher-color selector (no swatches, a more user-friendly UI). Progress screenie showing the color selector UI changing the color of the brush, the new padding for the image, and the crisper pixels from no AA. It seems that I have removed the AA caused by the border and anything else that modifies its size. 4-shade greyscale is now supported. © Copyright 2000-2019 Cemetech & Christopher Mitchell :: Page Execution Time: 0.407890 seconds.